More SEO! More competitors! More rankings! More details! The direct comparision between your competitors and yourself offers access to more in-depth analysis options than were possible in the past. In addition to the usual values, you also quickly receive the AdWords keywords your competitor works with, but you do not. Maybe he knows more than you – until now? Or in what subject areas does he invest when it comes to organic solutions? 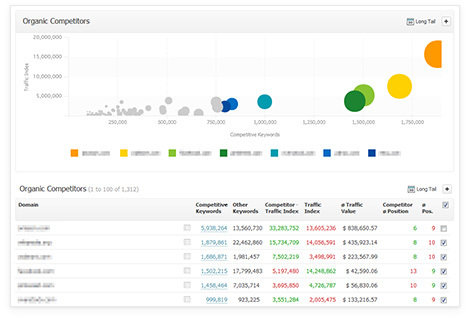 Plus: the competitor overview shows all real competitors in organic and paid search. And this in a very attractive illustration. 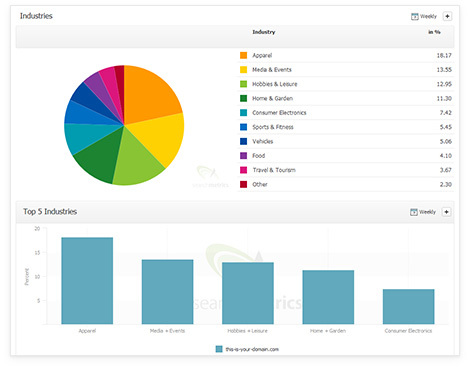 The overview is available in an Eisenhower graphic which allows direct competitor comparison. Travel, cars, fashion or sports? For good organic visibility it is important that search engines have the same sector view as your website. To let you see how Google sees your site, SEO+SEM Essentials offers an overview of which industries and topics the keywords you are found with belong to.